Haunted Houses in Atlanta, Georgia are some of the scariest haunted houses in America. Hauntworld.com tries to review only the best haunted houses in Atlanta, Georgia. When you are looking for simply the best, scariest, haunted houses in Georgia there is no other place to search than Hauntworld.com which offers our guests the best information to find Georgia Haunted Houses including the best haunted attractions in Atlanta, Georgia. There are many haunted houses in Atlanta that claim to the best haunted attraction but only one can truly lay claim to the being the scariest haunted house in Georgia... Netherworld Haunted House in Atlanta, Georgia. 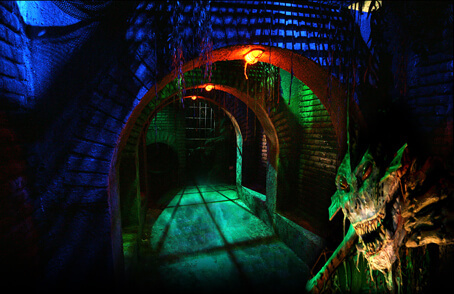 Netherworld is one of this industries more celebrated haunted houses as featured on countless television shows, articles, and top haunt lists. What makes Netherworld tick, what makes them successful? You are about to find out right now! These two guys have gone on a magical ride from a dream to living the dream. Right now we will explore every detail of what makes Netherworld on most people’s lists the best haunted house in America. 1. So tell everyone how both of you met, got started in the haunted house industry and then later created NETHERWORLD. That would be a novel in itself! I guess you are referring to Billy Messina and me ….Well, I was working for a haunted house chain called Silo X mainly for the Atlanta owner. Billy was working for one in town called Chambers of Terror. When The SiloX guy wanted to expand I asked Billy to join us. But that year The Silo X never opened so we decided to do our own haunt. The following year with the help of friends and family, and several other key players, we opened NETHERWORLD. Our goal was to create a highly themed, detailed and unique show that did not use the movie characters that most haunts were depending on at the time. Now 13 years later we are still marching down that road, although on a much larger scale! 2. As we know many times partnerships don’t work out, so how does your relationship work so well? What roles do each of you play in the success of NETHERWORLD? Additionally what advice can you offer other attractions with multiple owners to make a successful partnership? Well, one of the methods for succeeding in any group project is to have a well developed understanding of who is responsible for what areas of the production. For example when the event is in operation I always OPEN the event, i.e. I make sure every thing is ready to roll, every actor in place etc. Billy always CLOSES the event; i.e. makes sure what guests are in what lines, shuts down the ticket booth, and calls lights up. It is sort of like that times a million! Aside from clearly set responsibilities I would say you need to trust your partners totally; a lack of trust is a recipe for disaster. Also you need to have the same general views on how things should be done. I don’t mean walk in lock step because differing opinions are essential, but rather general views on things like spending money that allow for compromises that everyone can be happy with. 3. Both of you chose early on to visit a lot of different haunted houses and learn as much as you can from other people in the industry. How did that help the success of your business and what kinds of things did you learn along the way that stands out? It is both very important and just plain fun to network with fellow haunters! Visiting haunts and connecting does give you lots of great IDEAS…but more importantly it inspires and challenges you to try new things and to improve your operation. I love to see a place and be blown away by one aspect or another, it gets you going! Things over the years that stand out as I write this include the intense use of actors in Bloodview haunted house and the House of Shock, the level of set construction in the 13th Gate, the absolutely TIGHT operation of Rocky Point, the collection of antiques and aged prop detail in Dead Acres and the Darkness, the wild custom gags of Erebus and the Atlanta haunt Chambers of Terror, and the custom monsters of The Haunted Schoolhouse/Lab. 4. NETHERWORLD is also famous for creating ICON characters. What is the process in creating custom costumes and why are they important? Every year we re-theme both of our attractions. Once the themes, the names and natures of the creatures are designed, Bill Johnson, the special effects artist who creates our icons, will begin working on the “mask” of the character. Our costume department, led by Jayne Rogers will begin drawings and construction of the costume. Usually I will portray the character, so I acquire appropriate contact lenses, and figure out the nature of the character and how it will interact with the guests and the media. When we get it all together we do photo and video shoots. Bill will produce graphics, and Billy Messina will begin an extensive process to integrate the characters into our media buys including tickets, billboards, print and web advertising. Once on site media comes around I will portray the character on live TV. Often we will also make multiple suits, so that the character can be portrayed every night for the guests who visit NETHERWORLD by other actors on our staff. We feel the use of the icon characters combined with the overall re-themeing of the event is very important to both the marketing and success of NETHERWORLD. It puts a new FACE on the event and makes it fresh each year for both the press and the guests who come to see us. 5. Tell us about some of the things NETHERWORLD does to ensure the safety of your business, guests, and staff. We understand you have a security camera system, what role does that play? In the parking lot we have an extensive operations staff that makes sure the crowds remain orderly and flow correctly. Wearing light up vests and wielding flashlights they set up and modify extensive queue lines in several areas of the lot, hang at the back of the lines with signs to make sure guests know where they are going and direct the crowd as needed. They are backed up by numerous police officers who sort out any rowdy behavior, and direct traffic. The combination of operations with the lot actors may put as many as 40 people in the parking lot on a festival night. This large trained staff both deters problems such as line cutting, and makes quick response to any problems very easy. As guests prepare to enter the attraction, numerous signs list the rules of the event and audio tracks play them in English and Spanish. Doormen give a final telling of critical rules and screen one last time for things like lit cigarettes. Our camera system, (inspired by Nightmare on 13th in Salt Lake City) covers the parking lot and the inside haunts extensively, allowing instant identification of problems and a record of events to be kept. It also acts as a deterrence as guests are made aware of the surveillance before they enter by seeing themselves on a monitor. Every night the show is in operation we have EMTs on staff to insure that any medical calls staff and guest related can be instantly addressed. Each year significant upgrades are made to both the systems and staff that makes the event run smoothly, even under the crush of massive attendance. 6. NETHERWORLD has been one of the industry’s leaders trying to promote haunts nationwide, even putting your own money into national publicity programs. How have these efforts helped your own business while at the same time helping the industry? 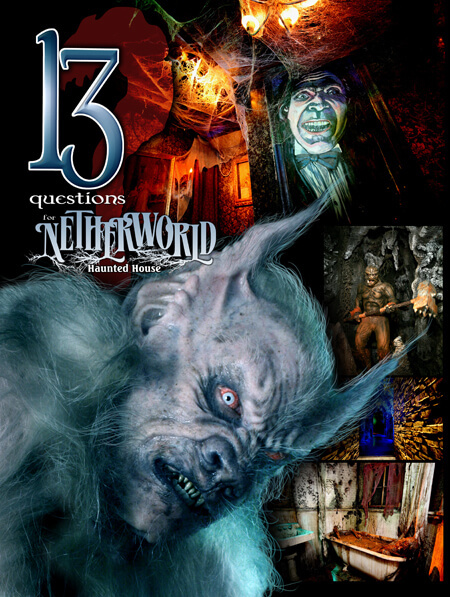 What was the motivation for NETHERWORLD to embark on a national publicity effort and tell us about the time and dedication you put into this effort. Every year since we opened we have grown in attendance. But in the last 3 years since the advent of the PR campaign you spearheaded we have seen a huge increase to levels we never thought possible. It just makes sense: Peel back the public perception of haunted houses as cheap 1 day set ups and you tap into an entirely different market of potential customers. I worked in TV news for 18 years and know how the media works. If you don’t give them a good hook they will find a bad one…it’s the last thing you want. What we did was to give them a reason to cover us and it paid off big time! The combination of promoting high tech - high production value haunts in national PR campaigns and on TV shows such as all the ones on the Travel Channel seems to have made a real difference nationwide. Now the public views Haunted Attractions as safe fun ways to celebrate Halloween, and they are showing up like never before. We got involved because we saw the need, but the time and money spent has been huge, that is the truth! 7. As we all know, marketing haunted houses has really evolved over the past few years. How has marketing NETHERWORLD changed over the past few years, what are the most successful ways to market your attraction and what do you think the future holds? Key is the quality of the event! You need to create a great product, brand it, and then CONSTANTLTY improve it. Once those items are in place, you need to remind your existing customers you are open while still finding NEW ones! Basically we use almost ALL forms of bought media, grassroots marketing, local and national PR to achieve these goals. Every year we alter our plans somewhat, depending on how the world is changing. Clearly traditional media, primarily Print and Radio is losing ground, while new forms, largely web based, are taking their place. Everyone knows that a dynamic website is essential! But you always need to look at the big picture, don’t forget your old fans by totally abandoning old media. What does the future hold? As we know, the single most important marketing element is word of mouth. But now it exists in many other forms, online, text messages, etc. The key is to tap into these areas of communication to get your message out. That is why we think ultimately that the most important aspect of marketing IS the event itself! 8. And now for something you are famous for but many people might not know. You hold events such as seminars and training year round to keep your actors connected to your attraction. Tell us about this program and how does it help your success? In the old days actors drove me crazy. You could build the sets and animations; control everything in your haunt except the actors. Then I realized something. The haunted house is nothing more THAN a set FOR your actors! Actors are what scare people, actors entertain people, actors bring a haunt to life! That is when we started putting more time and money into them. This approach takes many forms, one being the effort we put into costuming and make-up. But the real trick is finding, training and recruiting really good interactive haunted house actors. I always think of the scene in the Lord of the Rings movie when Saruman goes into the pits below his tower and watches the creation of Uruk Hai Orcs. They stir around the slime and BAM instant monsters! Wouldn’t that be great! However for haunters it is a bit more complicated! That is why we meet monthly for acting classes, go on trips to act in other haunts, and work on characters all year long. I call it “stepping through the door”. That is the moment an actor really connects with a character, with an act and really makes it their own. Sometimes it takes years, sometimes only one season, but when an actor finally creates and totally OWNS a character it is a great moment. It is almost as if you cannot create this sort of breakthrough, you just need to get all the ingredients together, stir the slime, and when the monster is ready, it emerges! Ultimately as a haunt owner you must love your actors and do whatever it takes to grow their skills. You will like the results I think! 9. NETHERWORLD also does a lot of year round promotion such as movie premieres, parades and other things. Tell us a few things you do to promote NETHERWORLD year round and how it benefits your business. We are all about grassroots marketing! It started in the early days when like any haunt we didn’t have two dimes to rub together. Now it is an ongoing program to not only keep our event in the mind’s eye of the general public, but gives our actors reasons to dress up like monsters and entertain the public! We have done many parades, but we have been banned from some for being too scary. Billy is hooked up with movie promotion companies, so we often hit horror premieres to make the reviewers spill their popcorn everywhere! The time we hit the Dawn of the Dead screening with 25 zombies comes to mind. Field day events, dodge ball competitions, concerts, Sci-Fi cons, nightclubs, etc. have all had visits from our beasts. Doing this level of grassroots work can be exhausting and sometimes you wonder if it’s worth it. But the value comes in building relationships with businesses and other promoters, not to mention the fun for your staff. If you have the time and the energy, go for it! 10. NETHERWORLD is also known of working with vendors to create custom animations and/or taking an animation you purchase and customizing it. Every year you change your theme. How important is changing your theme every year and customizing your props and animations you purchase from vendors? What do vendors think of you changing their products to meet your theme? It has always been our goal to develop new and unusual effects and monsters, and in the early days they were almost completely custom. But once vendors started bringing cool monsters to Transworld we started buying them. Realistically, you just cannot make things on a scale as say a big Scarefactory style prop without dedicating huge amounts of resources to it. It just made more sense to purchase these sorts of animations, and THEN rework them to fit the theme or environment we were using them in. 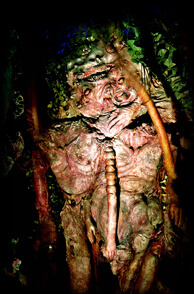 Another issue was to be unique…we never used movie characters (Freddy, Jason) but when EVERY haunt in the country has an Impaler, we wanted to be different by changing it. Now we still have some big monsters that are pretty much like we bought them, but in the fullness of time EVERYTHING gets a makeover! As far as having vendors make custom stuff, yes we love to do that! It really depends on the vendor though. Some are more into mass production; it’s easier to convert a purchased prop in that case. But we have had several vendors create custom creatures and effects from the ground up. Some of these have gone on to sell to many haunts but in some cases we have the only one made. We also make many unusual effects in house as well. Last year for example, we had a rat track that ran life size rats 20 feet towards the guests on a chain drive system. The mechanism to do this was pretty crazy! Another 2008 project was a dropping barrel stack, basically two 16 foot stacks of metal drums that slammed down directly over the heads of the patrons! As far as changing the themes and the shows we obviously feel it is very important, almost as if we were in the movie business and constantly producing sequels… It has to be LIKE the year before, but have enough different stuff in it to make it NEW and worth seeing. Vendors seem to love seeing their products used in different ways, most enjoy collaborating on projects and it helps them develop future product lines I think. 11. You have lots of actors that do stunts - can you tell me about those? It all started with sliding. Years ago inspired by the Haunted Media story on Knott’s Scary Farm I started sliding (sliding on the ground in the parking lot on knee pads). Within a few years lots of us were doing it. We have developed specialized gear we fabricate or have metal shops make for us on a custom basis, and extensively use the Ghost Ride sparker gloves to make huge trails of sparks when we slide. This sort of grew into building and buying other flying and movement devices, what we classify as “stunts”. Now we have a spin door (Hold on…it’s fast!) , actor lifter, actor lean (a custom steel spring return device that lets actors “lean” over the patrons and return), multiple flight tracks, a bungee system, and a levitating bed. We also have used many costume based stunts including stilts, lift boots, roller skates and a lean plate (a magic trick) among others. The goal is to create the appearance of “superhuman” abilities in our actors, to both allow unusual scares and create a “Gee Whiz!” reaction from the guests. This year we have several new systems in development with multiple vendors that will take this approach to a whole new level. Other actor based gags returning to the show are the infamous giant puppets. We used them a lot back in the days before all the huge animatronic monsters NETHERWORLD is currently known for. Now we have an entire class of actors that control monsters and inanimate objects, actually interacting with the guests, a human mind behind something totally non human. 12. 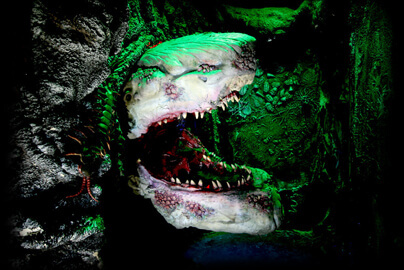 NETHERWORLD is also known for really cool sets and custom props. Can you tell me about those? 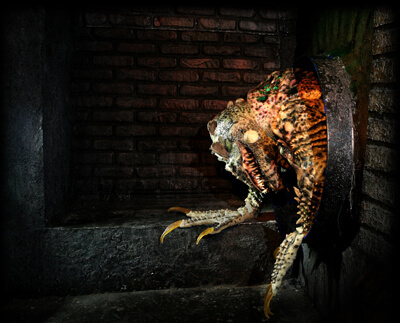 Also what are some of the other unique scares we might experience at NETHERWORLD? We do spend a lot, maybe too much time on our sets and props! Since we are affiliated with so many special effect and movie artists, we are constantly building set pieces for the show. These might be steam punk style lab equipment, disfigured corpses, or entire scenes. Since we always like to keep the ability to change, most of the sets are modular with vacuform and other portable facading techniques. After seeing the 13th Gate however, we started last year to build some more permanent style sets so curse you Dwayne! We may have to trade in the screw gun for a sledge hammer to make changes in the future! As far as props go we also get lots of antiques, fake plants and wall décor every year, in addition to new fabrications. 13. What is the future for NETHERWORLD and the haunted house industry? What does NETHERWORLD need to do over the next few years to keep your success strong? What does the haunted house industry need to do to come together and take the industry as a whole to another level? The future looks great! For us every year has shown growth both in attendance and in the amount of crazy cool new things we can bring to NETHERWORLD. As far as what we need to do the answer is NEVER STOP! You have to keep going forward, keep innovating, keep being challenged by unusual ideas, other haunts, and new ways of doing things. The industry as it stands right now appears to be on the upswing in spite of troubling economic times. It seems as though we are on the edge of a new era of cooperation between haunt owners. Yes, the future is so bright you gotta wear shades!